Spellbinding...a treat for the eyes and ears I had never heard of Glenn Gould before this movie was released, but I had heard so many good things about the film that I just had to check it out. Am I glad I did. The film is quite unconventional in that it is not a strict "biopic" in any sense of the word. The film -- much like the title suggests -- takes 32 vignettes that concern some aspect of GG's life. Gould, a Canadian classical pianist, was by all accounts an unusual yet charming man. 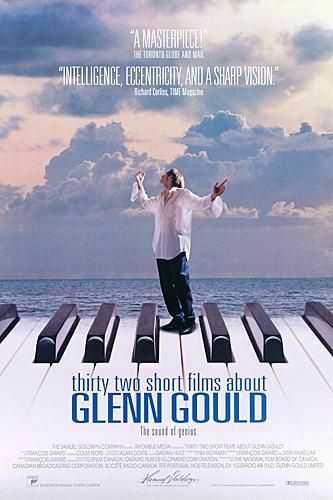 A merciless hypochondriac who popped pills incessantly and wore heavy clothing even in the middle of summer, Gould was also enormously talented, both as a pianist and a producer of highly unusual radio programs. The film examines Gould's life, his passions, his obsessions, and of course his music. The soundtrack is breathtaking. Colm Feore portrays the enigmatic Gould brilliantly. If you are a fan of daring, original films -- as well as a Gould fan -- you will not want to miss this.